One of the first things a writer needs to do is help the reader make a connection with the characters. This needs to happen in the first few pages. Most readers, and they should do this, read those first few pages to see if they can relate to and have a need to invest their time emotionally in them. In a romance there has to be a hero and heroine with a conflict, a reason to see what will happen. This can be a situation that the reader has faced before or is worried about facing personally in the future. Readers love to gain knowledge on how to face their world by seeing how others face it. In some cases, however, a romance is an escape, a fantasy they wish they could live in. In such a case they want to be entertained and given a chance to live a life much better than they could hope for. In those first few pages they want to know who these people are, not in full detail, but in a meaningful way. A good writer will give enough details that the reader can picture that person in their mind, but add details on their own to make the person come alive. Everyone has secrets, and it is those hidden secrets that make a reader turn the pages, hoping to discover a deeper level. It is the small insights into a characters emotions and thoughts about life that chip away at who they are. The best writers have a way of making the reader understand partially who these people are in a few words, the first few pages of the novel. One of my most popular novels is HER HONOR’S BODYGUARD which is about a judge who feels threatened and unprotected by the local police. During this time of fear and distrust all around her, she turns to a man that she was lovers with years ago. While she can trust him, she still never knows the real reason why they split. I have added the opening to HER HONOR’S BODYGUARD to show how their introduction to the readers is handled. I think this is, perhaps, one of the reasons this novel has been so successful. What in the hell am I supposed to do now? Noella Peterson stopped walking along the street as she studied a car that was slowing while it passed by her. While hesitating, she had second thoughts in revealing where she was heading. Although she felt like she had eluded everyone, she couldn’t be absolutely sure. She waited in the midday sun for the car to disappear quietly around a corner. The office front of this older building near the college in downtown Tampa offered her little to use for cover. She inhaled deeply, hoping the door would be unlocked so that she could enter quickly and disappear before the car made a circle. She studied the name on the window, which reassured her that she had the right place. Vance Mills, private detective, was about to obtain a new client. She twisted the polished, brass door knob and swiftly pushed the door open. Her heart raced as she rushed inside and closed the door behind her. After studying the dimly lit waiting area, she waited for someone to notice that she had entered the office. She heard no music playing, or in fact any sounds at all to interrupt the pounding of her heart. After studying the deathly quiet sensation of the vacant office, she wondered if she should come back later. No, she had come this far. A small light glowing above the desk, and another one on a table next to several chairs, sent additional quivers to her stomach. Still, with the lights left on, someone must be here. “Is anyone here,” she shouted, as the sparsely furnished room allowed her voice to echo. When she suddenly heard a bump coming from a side room, she realized that someone was there after all. She straightened her back and waited. The door swung open and in walked Vance who was wearing gym shorts and a muscle type t-shirt. The sweat glistening on his skin highlighted his rock hard body. Damn, she knew she shouldn’t stare, but he looked hot. As her heart raced, she refocused on his eyes. Johnny Ray has a passion for life and adventure that he loves to share with his readers. As an avid traveler and professional businessman conducting business worldwide for years he has made many interesting contacts and received numerous awards for top production. He has owned and operated several real estate companies, several insurance companies, and a stock brokerage company. He loves radio and TV talk shows, as well as speaking in front of various audiences. Feel free to contact him if you need a guest speaker. When it comes time to play, he is very active in many sports including dancing, swimming, tennis, biking, and skiing. While he loves adventures that are new, interesting and challenging, making friends that share his passions is a special gift. Johnny lives in Clearwater, Florida where he works full time as a writer, and he can be often found in one of the hundreds of coffee shops along the beach working on his next novel. He belongs to the Florida Writer Association where he recently won the Royal Palm Literary Award for best thriller, the Romantic Writers of America, and the Mystery Writers Association. He attends various national writer conventions throughout the year, as well as several local writing groups in the Tampa Bay area of Florida. 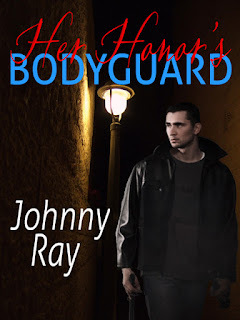 I have a number of Johnny Ray's book in my TBR - I need to read faster!